It’s been a great year for KTA, and 2015 promises to be even better. We’re getting ready for Issue 4, so feel free to submit your poetry and prose for our next annual issue. The deadline is March 1, 2015. We can’t wait to read your work! KTA – Issue 3 Has Arrived! We are beyond thrilled to announce that Issue 3 of KTA is available for purchase. The issue is chock full of exciting features, including work from our very own flash fiction contest winners, an inspirational writing prompt, and an engaging interview. What’s better in the fall than curling up next to the fire with a good read? Click here to order your copy! Also, stay tuned for information about our upcoming Issue 3 official launch event! Issues 1 and 2 had wonderful launch readings, and we look forward to continuing that tradition with the newest KTA. We welcome submissions for Issue 4. Check our our submissions page for details if you would like to submit your writing. Celebrate Blyber Thanksgivukkah with Free Shipping and a Free Gift! In honor of this epic, once-in-70,000-years event, KTA is offering FREE shipping and a FREE gift with all Killing the Angel – Issue 2 orders received between Wednesday, 11/27 and Monday, 12/2. Place your order by clicking here. KTA – Issue 2 is perfect for holiday gifts, stocking stuffers, Secret Santas, New Year’s Resolutions for reading for fun more often . . . you name it. As part of our Blyber Thanksgivukkah extravaganza, we’ll also rush deliver issues that are Hanukkah gifts so you can share the gift of literature with friends and family in time for the holiday. Simply indicate that preference on the ordering form, and you’re good to go. We’re also accepting submissions for Issue 3, so we invite you to submit your original poetry and prose. We can’t wait to hear from you! Happy summer! Issue 2 of KTA is in and available for purchase. In addition to original work from fresh talent, this issue features an interview with Naomi Shihab Nye and a prompt/poem combo from Tara Betts. Click here if you’d like to order a copy of Issue 2. We have already begun accepting submissions for Issue 3. Check our our submissions page for details if you would like to submit your writing. Finally, if you have any suggestions for an author you’d like to see interviewed or otherwise featured in Issue 3, shoot us an email: KillingTheAngelMagazine@gmail.com. We have officially extended our submissions deadline for Issue 2 of KTA to March 1, 2013. Click on our “Submissions” tab for more details. 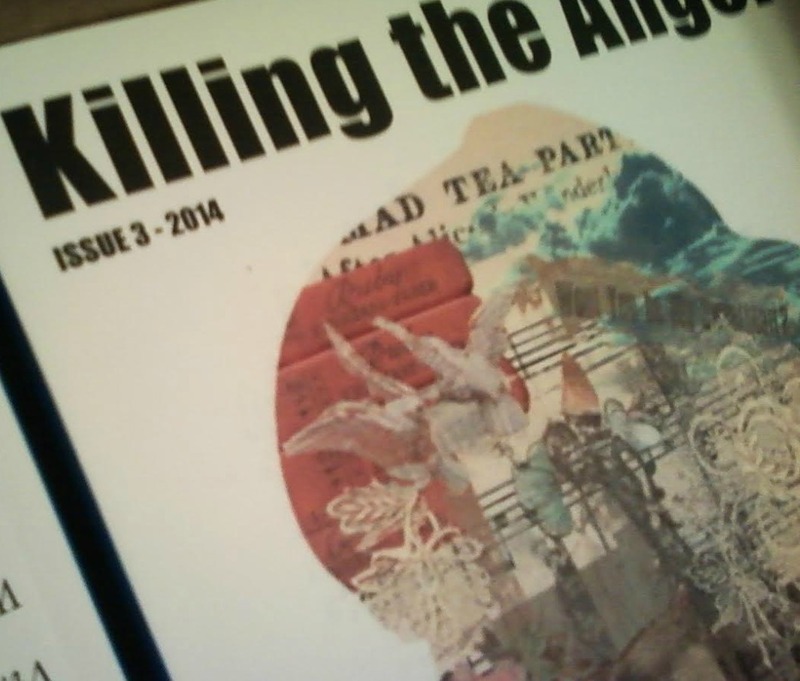 Submit your poetry and prose to Killing the Angel magazine’s second issue! The deadline is February 1. It is shaping up to be an outstanding issue–we’re thrilled to share the news that Tara Betts will be providing Issue 2’s writing prompt. We’d love for you to submit and be part of the excitement! Sneak peek for issue two, which will be available Summer 2013! We are so honored and proud that Issue 2 of Killing the Angel will feature a poem by England’s distinguished and prolific (not to mention incredibly witty and friendly) poet, Neil Curry. From his website: The poet Neil Curry was born in Newcastle upon Tyne, and now lives in Ulverston in the English Lake District. He read English at Bristol University, then taught at the University of Guelph in Canada and subsequently at secondary schools in England. His verse translations of Euripides, published by Methuen and Cambridge University Press, and in the USA by Doubleday, have been performed in many countries. His poems have appeared in many pamphlets and magazines, and have won several national prizes. On that note, submissions for Issue 2 are officially open from now through February 1, 2013! Click here for information. Don’t forget to mark your calendar for our NYC launch party on December 18, 2012, 7-9 PM at the KGB Bar in Manhattan! It’s going to be a great night.